In Autumn we made one of the best decisions since moving to chilly Stirling, we built our very own fireplace. This cosy little corner has become central to our daily lives throughout this past winter. I’ve been so drawn to its soothing radiant warmth and it has become a refuge where I plan my day, make phone calls, read, knit and kick back with a night cap when the children have gone to sleep. The fireplace has also become very useful to leave yeast dough to rise for freshly baked breads and my Polish cakes. I have had several friends and family ask us how we built the fireplace, especially after our recent storm where the fireplace was our savior during several blackouts! I thought it may be useful to introduce a DIY section to this site, since we have many more projects we are working on. Part of my absence from blogging recently, has been due to getting stuck into various projects and renovations, that have been keeping us busy. So I will endeavour to share our experiences and provide any tips or lessons we learn along the way. It is quite common to renovate and customise properties here in Stirling. I love how individuality is celebrated in the unique culture up here. No home or garden looks remotely similar to the other. Century old heritage homes sit next to modern architectural designs, with quaint cottages and partially renovated country homes in between. Such an electic mix, with the only similarity being the abundance of majestic trees wrapped in vine, weaving these homes together. Our dream is to achieve a harmony of rustic and modern, in natural tones with a subtle elements of mountain culture, that we fell in love with on our last trip to the Alps in Europe. When we decided to build our fireplace, we took a while to decide on the perfect location in our home. We currently have ducted heating upstairs, but not downstairs where we have our bedroom. Fortunately, we also inherited a significant amount of firewood with our property, so we wanted to use the opportunity to reduce heating costs in the cooler months. My clever husband devised a plan to have the fireplace installed in the corner of our lounge room, where the main bedroom sits directly underneath. We did this so we could direct some of the heat downstairs from the fireplace through a floor vent using a ducting system and fan. This has maximised the use of heat energy we have produced, without the need so a secondary heating system. A smaller fireplace in our bedroom was considered, but our concerns were the possibility it may produce too much heat for a bedroom, and the space required for the installation. The fireplace was an opportunity to add style to our lounge room, so we decided on a mix of natural grey stone tones and rustic timber for a cosy Alpine chic feel. 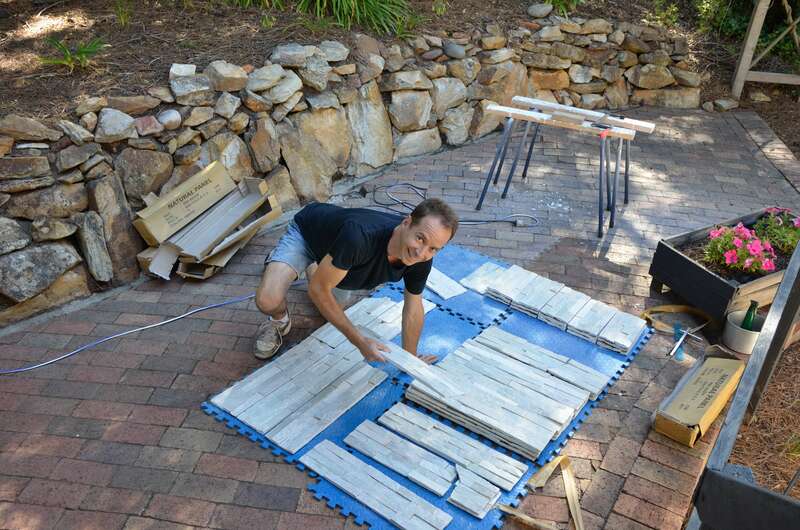 My husband Mark built the hearth himself using a simple timber frame, topped with a fibre cement sheet and durable tiles. We chose modern large grey stone tiles in a matt finish and matching grey grout. To achieve that stone-wall look we used stack-stone tiles that were easy to install using a tile adhesive called tile mastic. This adhesive is more suitable for heavy wall tiles and allows some flexibility compared to other tile adhesives. For a natural look, Mark offset the tiles so the end point of the tile did not line up and reveal a line along the wall. We chose a wood heater by Ultimate and have been very happy with the design and quality of the heater. There are three fan settings and the flue was included in installation price organised by the store. My favourite feature of the fireplace is the timber shelf that Mark carved from a log laying around the garden. He used angle brackets recessed behind the stone wall to hold it in place. It is so nice to have a hand made element and token of our garden inside our home, it has become a great mantel piece for displaying garden gatherings and candles. We are really happy with the result. The new fireplace has brought a new homey cosiness to our home. Mark’s clever idea worked and we have managed to heat our bedroom through the offset heat upstairs by about 5-6 degrees more during winter . We are also happy with the location we decided on as it is lovely having a window nearby to wander off and daydream while siting around the cosy warmth of the fire. 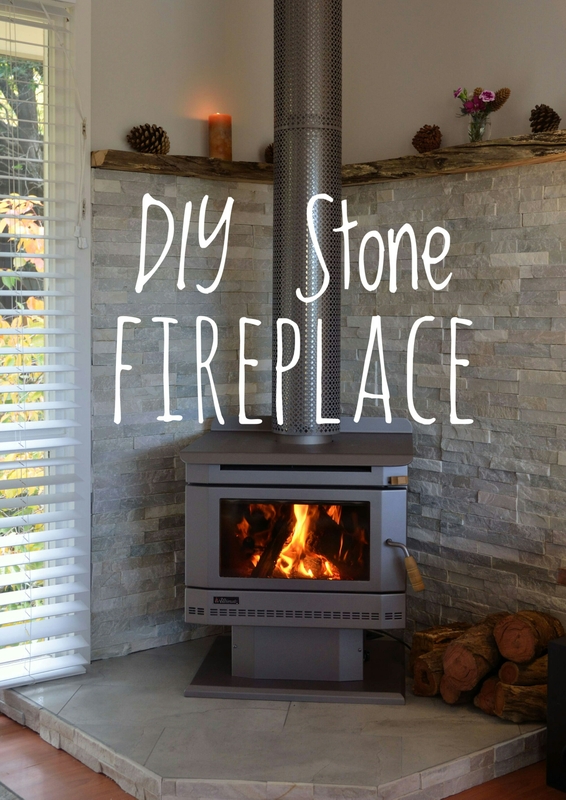 This entry was tagged adelaideblogger, adelaidehills, alpine, alpinechic, building, DIY, fireplace, homerennovations, interiordesign, stone, woodheater. Bookmark the permalink.